The Mark III antenna launcher. Trees make very nice antenna supports. Very nice, that is, if you can get a rope over the branches. That's always the tough part. During one of the W4DOC Atlanta Radio Club field days, I watched some of my fellow hams easily put up temporary antennas with a contraption similar to this one. I had to have one of my own, so I built it. Wrist Rocket - also known as a sling shot. Get the kind that uses surgical tubing as the elastic. I believe I found this unit at a K Mart for about $7. I've had it 20 years, and it still works fine. Eventually, the tubing will need to be replaced when it gets cracked and starts to separate. 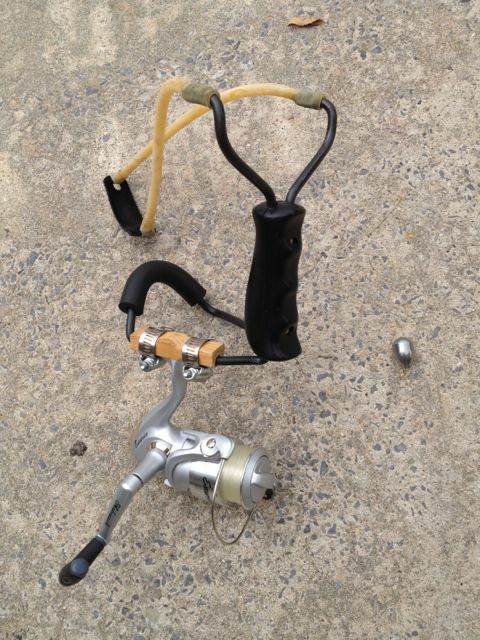 Fishing Reel - the original, or Mark I version, used a closed-face reel that I found for $4, probably at the same K Mart. Mark II upgraded to a 1960 Shakespeare open-face reel that my father-in-law gave me. Unfortunately, the winding handle broke and parts are unobtainium. Enter Mark III - a modern Shakespeare open-face reel for $20 at Walmart. Wrist rocket and the reel are joined together using a block of wood and a couple of hose clamps. The wood has a channel hollowed in it to fit over the wrist rocket frame. The open-face reel is important. Although I got a closed-face reel to work, the line had a tendency to bind a bit, which shortened the height and distance I could cast a weight. The open-face reel greatly reduces the resistance of the line playing out. Wear Eye Protection! No matter how good a job you do, every once in a while the line will snag on something, and the weight will snap back toward you. You might consider wearing a hard hat and a jacket as well. Use Appropriate Weight. The wrist rocket is designed for relatively small projectiles. If it is much bigger than the pouch, it won't fly right. Small fishing weights work well, but don't spend a lot of money on them. You will lose weights -- it's inevitable. The weight has to be heavy enough to pull the line down to ground level. If the weight won't fall down to the ground, you'll have to reel it back in and try again. I've had success with using 1/4" to 3/8" bolts with nuts. Take Your Time. Pick a good spot and try several shots to get the hang of using this thing. You'll have to aim slightly above where you want the line. You won't always get it in the right spot on the first try. Reel in Slowly. When you mis-cast, you have to reel the weight in. Careful you don't try to do it too fast. As the weight comes up to a branch, it will start to swing, and if you reel in too fast, the weight can easily wrap around the branch. At this point, you have no choice but to pull until the weight comes free, or the line breaks. If you pull really hard, beware that the weight can come back at you like a rocket. Use 10-15 lb Test Line. Some cheap reels come with line. If it isn't a strong line, best to pull it off the reel and use something known. Nylon line is really cheap. Don't haul your halyard directly. Once you have the fishing line over your target, use it to haul up a small rope. I have 500 feet of 1/16 inch braided nylon rope for this purpose. I then use that line to haul up my 1/4 inch dacron halyards. Don Wilhelm W3FPR gave the me answer for fixing my K2/100. He suggested I replace D16 and D17, as they may have gone bad without failing open or shorted. It took a while to get the parts from Mouser. But these 1N5711 diodes were only $0.10 apiece. So, I bought 10 in order to have some spares. Replacing D16 and D17 did the trick. I managed to test one of the diodes I removed (the other was destroyed in the desoldering process), and it showed a nearly correct forward voltage on my DVM, and about 3 times that value when connected in reverse. The diode action of the part was clearly compromised. A new part gave a low forward voltage, and an open when connected in reverse. I suspect these diodes, and possibly the EL5146C might have been damaged by a stray static discharge sometime in the last year. Perhaps a good thing to have on hand -- although Don did indicate that 1N4148 diodes would work OK as a temporary substitute. With the new diodes in place, the SWR Null Adjustment went well, giving a clear null down below 100 mV. More importantly, it read an SWR of 1.0 on all bands. The rest of the alignment went smoothly, and the rig appears to be producing the correct power levels on all bands. Made a quick contact with HA8RM on 80m to confirm the rig is working again. I think it is cured. Well, it's been slow going for my ailing K2. I put the tested U5 - 78L05 back in the board and cut pin 7 of U6. The KPA100 once again responded to the main K2. I replaced U6 with a machine pin socket, and after waiting another week, I finally got the part from Elecraft. With U6 replaced, I went through the KPA100 alignment steps. First problem was the SWR Bridge Null Adjustment. While I could get a clear null, the display never showed anything less than 1.1 SWR on 40m. Next to the Power Calibration. This went fine as well, but when I checked the SWR on all the bands, I received a 1.8 SWR on 80m, and 2.6 on 160m. The highest bands gave a 1.0 indication, but most of the others were 1.1, just like 40m. I double-checked my dummy load with my external watt meter. It appears they are 1.0 on all bands. * 80/160m - K2 indicates about 50 watts (5 bars), and sometimes I get a Hi Cur warning. The external watt meter shows 100 watts, or perhaps a little more. Something is obviously wrong with the power measurement circuits here. Elecraft suggests that the D16 and D17 diodes are "half bad" -- that is they have been damaged enough to change their characteristics, but not enough to fail open or shorted. Next step is to replace them. I just got the parts from Mouser this weekend. We'll try more repair work this week. It would be very nice to get the K2/100 up and running again. I'm guessing there might have been some damage from an electro-static discharge of some kind.